FIIs were net buyers of equity on all three trading days this week. Their total net buying was worth Rs 18.3 Billion. DIIs were net sellers on Wed., but net buyers on Mon. & Tue. Their total net buying was worth Rs 0.53 Billion, as per provisional figures. The number of companies that failed to meet earnings expectations during Q2 (Sep ’18) outnumbered the outperformers by 2.5 times. As many as 20 Nifty companies saw EPS downgrades against 8 with EPS upgrades of 3% or more. India Inc’s foreign borrowings dipped nearly 66% to US $1.41 Billion in Oct ’18 against US $4.09 Billion through ECBs and FCCBs in Oct ’17. 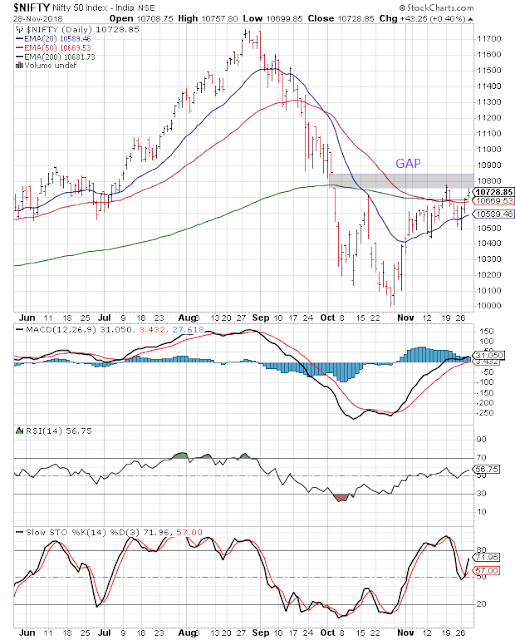 The daily bar chart pattern of Nifty had partly filled the downward ‘gap’ (of 89 points formed on Oct 4) by rising above its three EMAs to touch an intra-day high of 10775 on Nov 19. Bears attacked immediately. Nifty dropped below its three EMAs and touched an intra-day low of 10490 on Nov 26, but formed a ‘reversal day’ bar (lower low, higher close) and climbed up to test resistance from the ‘gap’ once again. If FIIs continue to buy, expect the ‘gap’ to be completely filled. The down move may resume even if the ‘gap’ gets filled. Note that the ‘death cross’ of the 50 day EMA below the 200 day EMA – which technically confirms a bear market – hasn’t been a convincing one yet. That doesn’t mean bears have given up. Daily technical indicators are looking bullish. MACD is rising above its signal line in bullish zone. RSI has bounced up after briefly falling below its 50% level. Slow stochastic corrected overbought conditions and has bounced up after getting support from its 50% level. Nifty’s TTM P/E has moved up to 25.96, its highest level this month and much higher than its long-term average in overbought zone. The breadth indicator NSE TRIN (not shown) looks poised to re-enter its oversold zone after falling from it. Some consolidation or correction may follow. Another quarter has come and gone, without the expected earnings growth from India Inc. Index valuation is already high. Small investors would do well to ignore bullish index projections of analysts. Stick to stocks of fundamentally strong companies that generate a lot of cash, don’t require regular capex and grow steadily rather than spectacularly.